Imagine employing a consistent follow-up process that everyone can share. Whether an employee with twenty years' experience or a new recruit uses my system, the result is the same—highly professional communications are produced and requests for information are fulfilled within seconds. Wouldn't you agree that it's important to impress prospects by being responsive? Recently, a client asked me to build a content-management interface, permitting instant fulfillment of user manuals, data sheets and general information. My client's customers and prospects were calling daily to request information. Since his salesforce was mostly engineers, they had little grasp of what was required for customer service and took days to answer requests. Furthermore, each salesperson sent his own version of collateral material along with a less-than-perfect cover letter. Consequently, I suggested automating fulfillment using my eFormTM interface technology. I rounded up the latest versions of all the documents and built a central repository of information on the Web with a user-friendly browser interface. 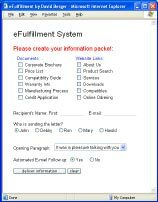 Within seconds, employees could access the eFormTM and, by clicking on a few check boxes and entering a recipient's name and e-mail address, deliver specific information along with an expertly-crafted, personalized letter. Moreover, eFulfillmentTM complements any call center. Imagine call center personnel having the ability, within seconds, to fulfill information requests and notify you of hot prospects. This tool is a perfect addition to any Always-on Marketing® campaign. My eFormTM technology offers selectable user signatures and allows clients to eliminate conventional printing and mailing costs, while improving overall effectiveness. I've expanded on the eFormTM concept and developed an advanced eCRM system I called APSS (Automated Personalized Selling System). I invite you to read more about it below. Wireless access is key to eFulfillment. The more efficient a system is at delivering relevant content (in real time), the smaller the information stream can be; hence, my system integrates with mobile phones via the Wireless-web. Sniffer technology can sense the receiver's viewing capabilities and dynamically create image-rich content for transmission across specific communication media including the Wireless Web and SMS. Later this year, I plan to roll out interactive mobile-phone applications including mCoupons, mSurveys and mVoting. Please click on the Wireless Marketing link below to learn more about how can help you. Automotion: I created a Web-based automated fulfillment system, incorporating user-selectable personalized signatures. 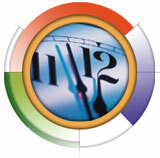 In seconds, my client now fulfills specific information requests that previously took up to thirty minutes. 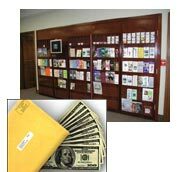 Huron Valley Printing & Imaging: In order to minimize top management's involvement in answering frequently asked questions, I created an efulfillment system. My system allows any employee to respond instantly with a professionally written e-mail and a link to HVPI's Website, pointing directly to the customer's answer. JALPAK: I developed a proof-of-concept eForm for the Detroit branch of Japan Airlines travel office. My system allows branch employees to fulfill requests rapidly for JALPAK travel-realted information. Employees effortlessly send personalized e-mail with specific links to Japan Airline's corporate Website—including up-to-the-minute Japan rail-pass pricing, availability of special tours, etc.